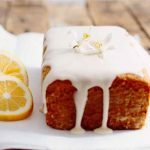 This vegan lemon pound cake recipe is everything you love about regular pound cake… just without the dairy! With a simple & delicious lemon glaze. Preheat your oven to 350°F. Melt a bit of margarine and add to an 8×4″ baking pan. Use a pastry brush to spread it all around the pan, making sure to get in all the corners. Add about 2 Tbsp flour to the pan and shake it around until fully coated. Tap excess flour out and set aside. Add the margarine and the sugar to the bowl of a stand mixer with the paddle attachment. * Beat on medium speed until fluffy, about 4 minutes. While the margarine and sugar are being creamed together, combine the almond milk and flax seed in a medium bowl to make a flax egg, and mix well. Grate the lemon zest and add it with the lemon juice to the milk mixture. In another bowl, combine the flour, salt, baking powder, and turmeric. Add the aquafaba to the mixing bowl 2 tablespoons at a time, and beat for about 20-30 seconds between additions. Add about 1/3 of the flour mixture to the mixer and mix on low until just incorporated. Follow with half the liquid, and mix on low to combine. Repeat with 1/3 the flour, the rest of the milk, and then the remainder of the flour. Pour the batter into the prepared 8×4″ loaf pan. Bake for 50-60 minutes, tenting with foil after about 45 minutes if needed to prevent over-browning. When done, a pick inserted into the center should come out clean. Let cool in the pan for 15 minutes, then carefully run a thin knife around the edges and invert to remove from the pan. Gently flip to right the cake, then let cool completely before glazing. Sift the powdered sugar into a medium bowl. Add the lemon juice and stir until incorporated. Drizzle over the top of the cake, spreading with a spoon if needed. Let harden for 1-2 hours before serving. You can either let your margarine sit out for an hour or two, or heat it in the microwave for 20 seconds. Aquafaba is the liquid found in a can of chickpeas, and it makes an excellent vegan egg replacement in baking. You can omit if you’re weirded out by it, just replace with an equal amount of almond milk and an extra tablespoon of flax seed. The cake won’t rise quite as nicely. Use Meyer lemons if you can find them. I don’t recommend just using cooking oil spray to coat your pan – it’ll stick. Grease with margarine and then flour the pan for best results. You can use a hand mixer for this. I don’t recommend creaming the margarine and sugar together with just a whisk since it’ll be difficult to beat enough air in, but you’re welcome to try. I recommend letting the cake sit for 24 hours before eating – the texture improves a bit.